The eastern section of the JR Osaka Loop Line crosses through this district. From Kansai International Airport, take a JR Haruka or Kansai Airport Rapid service to Tennoji and change to the Osaka Loop Line in the direction of Kyobashi. By standard JR trains the trip takes around 75 minutes to Kyobashi and costs ¥1190. From the bullet train station at Shin-Osaka, take any regular JR train one stop to Osaka station and change to the Osaka Loop Line towards Kyobashi (15-20 min, ¥180). From Kyoto, an alternate method of reaching the area is to use the private Keihan Railway. The railway runs from the eastern section of Kyoto city and runs through Kyobashi before terminating at the business district in Yodoyabashi. From Shichijo station (a 15-minute walk from Kyoto Station) it takes around 40 minutes to reach Kyobashi (¥400). Taking the Kintetsu Railway from Kyoto Station to Tambabashi and changing to the Keihan Railway takes about an hour and ¥600 to Kyobashi, versus around 40 minutes and ¥800 by JR.
34.68722135.525831 Osaka Castle (大阪城 Osaka-jō) (the park can be accessed on a number of lines, but the castle is closest to Osaka-jō Koen station on the JR Osaka Loop Line). 9AM-5PM daily, closed around New Years. Osaka's best known sight, although it's a concrete reconstruction that pales in comparison with, say, Himeji. Think of it as a museum built in the shape of a castle, rather than as an historical castle. Still, it's pretty enough from the outside, especially in the cherry blossom season when Osakans flock to the castle park to picnic and make merry. Naniwa Palace Site Park or Naniwanomiya can also be found south to Osaka Castle Park (although it's one of Japan's oldest habitats and palace sites, today it's little more than an empty grass field where the outlines of Naniwa's palace foundations from around 643 AD have been partly recreated in concrete). The grounds are free, and the castle costs adults ¥600, children free. 34.682722135.5208062 Osaka Museum of History (大阪歴史博物館), 1-32 Otemae 4-Chome Chuo-ku (5-min walk from subway Tanimachi 4-chome Station; also accessible via Osaka Castle or from JR Osaka-jō Station). M-Th 9:30AM-5PM, F 9:30AM-8PM, closed Tuesday, or Wednesday of Tuesday is a holiday. 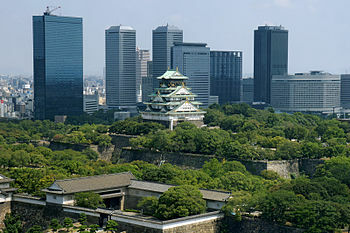 An ideal place to learn all-abouts of Osaka's history. Enjoyable view over Osaka Castle and the OBP skyscrapers. adult ¥600. 34.681667135.533 Peace Osaka (大阪国際平和センター), ☎ +81 66 947-7208. Tu-Su 9:30AM-5PM. A museum dedicated to the promotion of peace through displays of war. Because it is an Osaka museum, it features the effects of the bombings on Osaka in World War II. While this is of some interest, the exhibitions depicting the atrocities committed by Japan against China, Korea, and Southeast Asia are what make this museum truly worthwhile. There is also an exhibit with displays relating to the atomic bombings of Hiroshima and Nagasaki. Exhibits have English explanations. CarpeDiem Inn (カルペディエム), e-mail: info@carpediem-osaka.jp. Traditional-style house and garden within walking distance of the Shiroyama Temple. Dormitory ¥3500, private rooms ¥10000 for 2. This district travel guide to Osaka castle is an outline and needs more content. It has a template, but there is not enough information present. Please plunge forward and help it grow! This travel guide page was last edited at 01:25, on 11 March 2019 by Wikivoyage user Ground Zero. Based on work by Wikivoyage users Traveler100bot, Ibaman, NMaia, 隼鷹, AlasdairW, Drat70 and JRHorse, Wikivoyage anonymous users 88.128.80.107 and 168.168.33.250 and others.